Deputy Health Minister reiterates this morning: If Draft Law doesn't pass, he won't support budget. Deputy Health Minister Yaakov Litzman (United Torah Judaism) is maintaining his position and this morning made it clear that if the Draft Law does not pass the three readings necessary to turn it into law by the time the budget is approved, he will not support the budget. "The preliminary proposal doesn't satisfy me," Litzman explained in an interview with Army radio Galatz. "They're making fools of us. As long as they need us to vote on the budget - they fall into line. Once the budget passes, they'll continue to laugh at us and won't advance the draft legislation's continuation. So what does it matter? If there's no Draft Law, there'll be no budget." The current draft law is temporary and must be renewed within several months. The coalition crisis began last week, when haredi lawmakers warned the Prime Minister that they would refrain from voting for the state budget, potentially denying the government a majority on the critical vote, if legislation securing army deferments for yeshiva students is not passed. Failure to pass the spending plan could lead to the dissolution of the Likud-led government and new elections. The "Draft Law" would include a new "Basic Law" enshrining Torah study as a basic value of the State of Israel, thereby allowing the government to circumvent a 2012 ruling by the Supreme Court. The ruling, made in response to a suit filed by secular Israelis, declared allowing haredi yeshiva students to defer army service to be discriminatory. Litzman added that the political situation will change only when they decide to change direction on the budget schedule. "We can postpone the budget for two months and in the meantime they can finish the Draft Law. They have until the end of December to transfer 2019's budget. So why the pressure?" 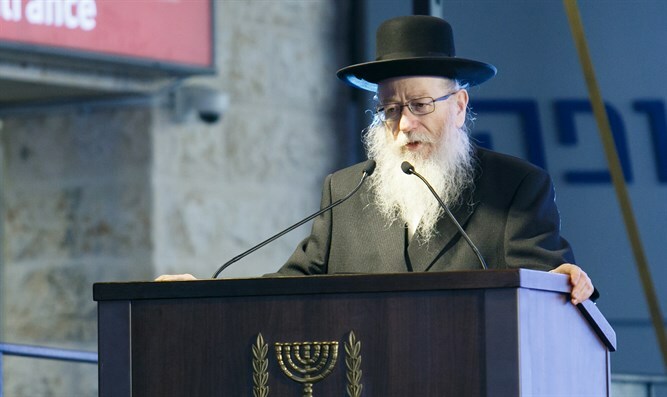 Litzman explained that he is not alone in this crisis. "All the party heads sat in the meeting with the Prime Minister: Myself, Gafni, and Deri. I also want to remind you that the instructions we have are from the Hasidic Council of Torah Sages, attended by my other colleagues in Agudat Yisrael Meir Porush, Menachem Eliezer Moses, and Yisrael Eichler. So it's above my head," he said. He added that in the past "the Left was willing to see our point of view, but beyond that, everyone knows this is a cornerstone of the coalition agreement. The agreement states the coalition ensures this issue is anchored in the agreement and therefore must be implemented. We're open to other proposals that will be acceptable to us - but for the time being they don't exist."